Here in San Antonio we are exposed to a variety of weather patterns. We typically have over 110 days each year where temperatures reach or exceed 90 degrees. On the other hand, winter can bring around a couple months; worth of days that are near or below freezing. Add to that the yearlong moisture we get in the form of rain or humidity and it is clear that we don’t enjoy the most moderate of climates. In fact, one federal study shows that San Antonio is the 4th hottest city in the nation! All in all, proper insulation of your home and office can make a big difference in the comfort of both your home and your pocketbook. And we want to help our neighbors save big on energy cost and live more comfortably, all while making the planet greener. Go Green With Your Attic Insulation In San Antonio ! Traditional attic insulation material like fiberglass or cellulose provides a barrier to heat transfer. Foam insulation also does not allow air to pass through it, creating a 100% airtight barrier thus stops convection heat transfer in its tracks. You could liken it to the difference non-insulated or poor quality insulation to high-quality insulation by comparing a knit sweater versus a windbreaker. The transfer of air makes a huge difference when it comes to maintaining conditioned temperatures in your home. Another reason spray foam stops air leaks is because of its unique application. By design, it is able to completely reach and fill-in the tiniest nooks and crannies and spaces of your home. No other insulation can do that. Once it is sprayed into place, it permanently sticks to any surface and then expands up to 100 times its application thickness thus completely sealing out the outside environment. Due to quality insulation’s amazing ability to completely seal your home, your family will enjoy a healthier more comfortable living space because irritants like mold, dust, pollen and other allergens and even rodents and insects will find it much harder to make their way into your home. Certain kinds of insulation can increase your home’s property value. Foam insulation, for example, has been proven to add structural strength to your commercial building or home. Tests show it especially helps increase a structures durability against high twin earthquakes quakes. It also has been proven to help prevent attic fires. This could obviously save you on unnecessary repair bills and will add additional value to your home when it comes time to sell. When our trustworthy, local contractors install this green insulation in your San Antonio private or commercial property, you can rest assured that you are making one of the best investments possible; an investment that will pay off for years to come by saving you big on utility bills and drastically improving the quality of your indoor life, all while helping save our planet. Could you ask for anything more? How does spray foam insulation perform in the cold? 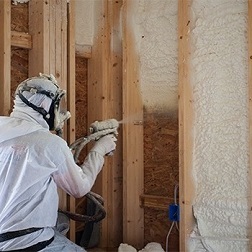 What is the difference between open and closed cell spray foam insulation? Why is a sealed home so important? What Types of Insulation are Available in a San Antonio, Tx?